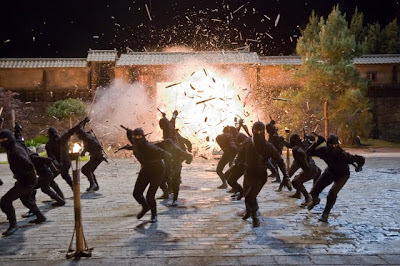 In addition to enlisting the contributions of renowned martial arts star Sho Kosugi and Olympic Taekwando qualifier Rick Yune for the latest Wachowski Brothers collaboration inspired by a fight scene in Speed Racer, power tumbling champions, acrobats, stunt team members and doubles for Jet Li, Donnie Yen and Jackie Chan were hired for the outrageously bloody fourteenth meets twenty-first century tale of a Ninja Assassin. The only problem is that in the process of bringing together this many skilled professionals, the filmmakers waited until literally the last fifty-three hours to bring aboard a screenwriter who could match the talent onscreen with comic book, Babylon 5 and Changeling scribe J. Michael Straczynski. And even though he did the best he could to help out his friends, the rush-job shows as there's little to recommend this impressively stylized yet extraordinarily gruesome effort wherein, when dialogue is even uttered, it's either laughable or hints that beneath the surface Straczynski had a much better story he was interested in telling than the simplistic all flash and no substance one served up by Matthew Sand. As an ardent fan of the genre, I saw the references left and right and appreciated the homage to classic martial arts sagas of revenge but there's so little plot linked together in two distinctly different stories -- think John Grisham's The Pelican Brief meets Fist of Legend -- that ultimately it's an arduous exercise of excess, ego, and every single gallon of fake blood that was available to Warner Brothers' crew during the filming of the movie in Berlin. 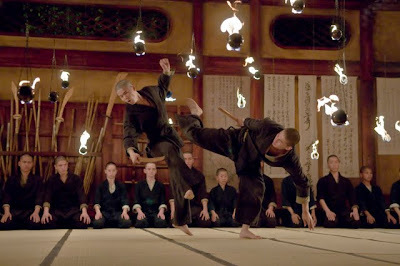 Essentially, the heart of the film lies within the charismatic and attractive Raizo (Korean musician Rain) who was taken as a boy along with many other orphans, lost or kidnapped children into various Yakuza clans where he was dominated by the sadistic lead Ozunu warrior (Kosugi). 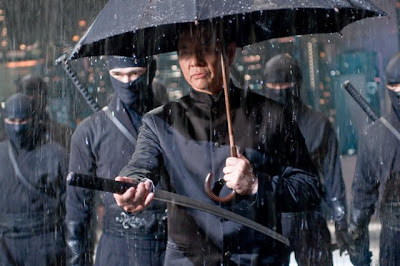 Trained to treat pain as though it were candy and ask for more, the young Raizo became a ninja weaned on old traditions yet instead of a code of honor, the Ozunu have embraced the code of business, exchanging red for green-- hired out to the highest bidding governments to serve as assassins. 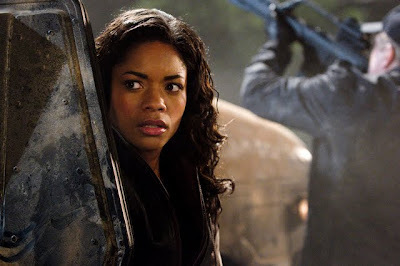 When a beautiful forensic researcher (Naomie Harris) discovers the paper trail that leads from world leaders directly to the Ozunu, the rebellious Raizo is her only hope at staying alive long enough to expose the corruption for good. Naturally, heads begin to roll as limbs spray geysers full of blood in some purposely over-the-top fight sequences inspired by vintage martial arts classics yet the problem with Assassin is that, when it's combined with today's filmmaking approaches and technology worked right into the story, the fact that we don't feel anything or feel terribly invested into the story beyond a surface level of “don't kill our protagonists” is inexcusable from a storytelling perspective. Although it's hardly the fault of J. Michael Straczynski since he was invited to the party much too late, for the Wachowskis, this marks the third dud in a row following V for Vendetta and Speed Racer, which, much like this production directed by James McTeigue have moments of artistic precision that simply thrill you as in one sequence where a fight at Interpol headquarters leads directly into high speed Berlin traffic. Yet, aside from being expertly made as Wachowski passion projects, there's just not enough to make you care enough about these cool, poorly written, displays of eye candy whether it's via Racer's CGI or the pure artery bursting carnage of Assassin which nonetheless will entertain martial arts junkies and give your speakers a workout as throwing stars and chains seem to splice bones from every corner of the room.